Recently there has been a lot of the Liebster Award going around (when you say it like that it sounds like a disease). I can see that it can be fun to complete, I can see that it will generate some traffic between bloggers, but I’m still in two minds about it. Don’t get me wrong, I like the general idea, but I’m not big on following rules on the internet. I’m wondering why the number chosen is 11? Does it have some magical properties I don’t know about? I’m not sure who started this Award, but, personally, I feel a bit overwhelmed by all the 11’s. So, I decided to try my own version, an award of my own, The “Bare for Fred” Award. Inspired by my best friend Fred Bare. you don’t have to pass it on. or no number at all. or even to make none. Where do you think the socks go when they disappear? If you were a Zebra and could choose your 2 colours, what would the be? That’s all there is to it, Fred Bare will be watching in an – tic – i – pation. (He’s a fan of the Rocky Horror Picture Show, I had to tell him suspenders really didn’t suit him, he was pretty depressed about that). Previous Article Question 6: Can Houses go Zombie? Next Article Leibster Award – I don’t follow rules well. I’m supposed to be doing our 101 homework but just loved this when it appeared in my reader! And my answers – I had them straight away! 1) Why socks go down the hole with Alice! Where else could they possibly be go? 2) Red and Blue. My mother always dressed me in red and my sister in blue.I always wanted the blue but I like red, too. Thanks for doing that. I’ve been out today and only just got home so I haven’t even looked at the homework yet. It was great to see your answers. I do like little frogs. I love it!!! The questions are deliciously mad!! The socks go to a parallel world, where they live in harmony with teaspoons, coathangers, and earring backs! If I were a Zebra, I would totally non-conformist, and wear cyclamen stars on an azure background! With glitter! Do I like frogs? Guess I must do, the amount of time I have spent kissing them!! Do I win the bear? Please say I win the bear?!! Glitter and cyclamen stars – oh yeah. You are winning so far! But, and I say this with great friendliness – I am sorry – YOU CANNOT HAVE THE BEAR. If I had another Bear you could have him, you can have a virtual image of the bear, you can adopt a bear from anywhere, just not Fred Bare. Deep Background: Fred Bare is the bear that spent time with my hubby whilst I could not. 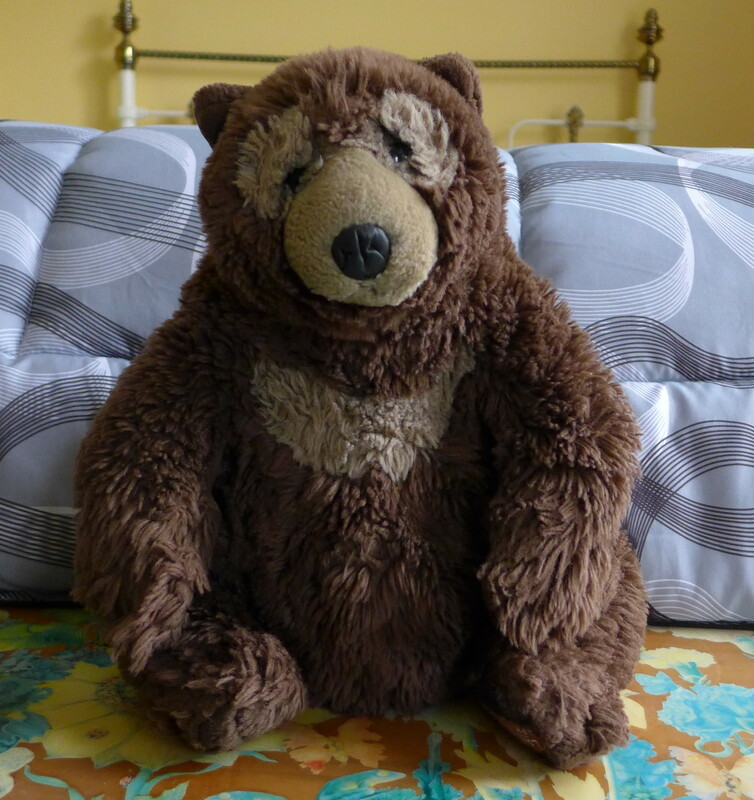 Fred Bare is the bear that my children hugged, when they couldn’t hug their Dad. So Fred Bare is MINE. Mine I say, and you shall never have him, you temptress. This is brilliant. I’m not good with the awards, but I’m totally up for this! 1. Socks evaporate to escape the earth’s atmosphere and then solidify as shooting stars. Every shooting star you see is a lost sock. 2. If I were a zebra I’d wear purple and yellow so I could hide in the irises. 3. Frogs are awesome. I hope they don’t disappear. Did you know they are really fragile little things? Ooh, I shall be watching for the shooting sock stars from now on. I like irises, such contrasting colours. Yes, I like frogs, always have ever since a young child.